There’s nothing more special than baking a little something wonderful for your Valentine! 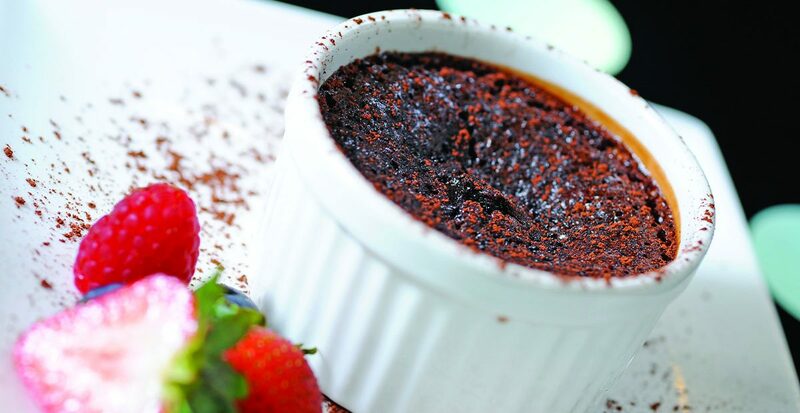 So if you’re pouring your love into something sweet this Valentine’s Day, why not treat your special someone to a velvety Chocolate Molten Lava Cake? Word on the street is that it’s one dessert that just oozes love! But before you get to baking, be sure to look over the full recipe below as you will need all sorts of fun things like ramekins, chocolate, and berries. 1. Using the 2 tablespoons butter, grease the 8- to 10-oz ramekins or souffle dishes. Place ramekins in a baking pan; set aside. 3. In a large mixing bowl, beat eggs, egg yolks, granulated sugar, and vanilla until thick and lemon colored. Fold 1/3 of the chocolate mixture into egg mixture. Fold remaining chocolate mixture and flour into egg mixture. Spoon about 2/3 cup batter into each prepared ramekin. 4. Bake in a 425-degree F oven about 12 mins or until cake edges feel firm. Cool in ramekins on a wire rack for 2 to 3 mins. Using a knife, loosen cake from sides of ramekins. Invert onto dessert plates. Sift with powdered sugar.